A cautionary tale of the horrors that can ensue when man experiments with nature, from the father of science fiction, H.G. Wells. This is the scenario for H. G. Wells’s haunting classic, one of his most intriguing and visionary novels. Living in the late nineteenth century and facing the impact of Darwin’s theory of evolution, Wells wrote this chilling masterpiece about the characteristics of beasts blurring as the animals turn into men. 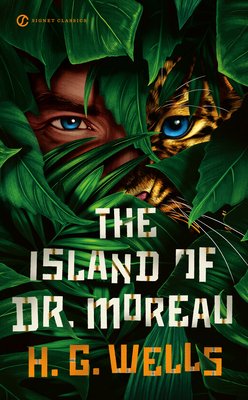 Dr. Moreau, a scientist expelled from his homeland for his cruel vivisection experiments, finds a deserted island that gives him the freedom to continue torturous transplantations and create hideous creatures with manlike intelligence. But as the brutally enforced order on Moreau’s island dissolves, the true consequences of his experiments emerge, and his creations revert to beasts more shocking than nature could devise. A genius of his time, H. G. Wells foresaw the use of what he called the “atom bomb,” the practice of gene-splicing, and men landing on the moon. Now, when these have become part of everyday life, his dark fable serves as a compelling reminder of the horrors that reckless experiments with nature can produce. Herbert George Wells (1866–1946) left school at thirteen to become a draper’s apprentice (a life he detested); he later won a scholarship to the Normal School of Science in London, where he studied with the famous T. H. Huxley. He began to sell articles and short stories regularly in 1893. His immediately successful novel The Time Machine (1895) rescued him from poverty. His other “scientific romances”—The Island of Dr. Moreau (1896), The Invisible Man (1897), The War of the Worlds (1898), and The First Men in the Moon (1901)—made him the father of science fiction. Dr. Nita A. Farahany is a Professor of Law and Philosophy and the Director of the Science and Society Initiative at Duke University. In 2010, she was appointed by President Obama to the Presidential Commission for the Study of Bioethical Issues. She is a widely published scholar on the ethical, legal, and social implications of the biosciences and emerging technologies, and a frequent commentator for national media and radio shows. Farahany is an elected member of the American Law Insitute, a Board member of the International Neuroethics Society, a coeditor and chief founder of the Journal of Law and the Biosciences, and recipient of the 2013 Paul M. Bator Award given annually to the outstanding legal academic under forty. She holds an AB (Genetics) from Dartmouth College, a JD, MA, and PhD (Philosophy) from Duke University, and an ALM (Biology) from Harvard University. Dr. John L. Flynn is a three-time Hugo-nominated author and longtime science fiction fan and critic who has written ten books, numerous short stories, articles, reviews, and a screenplay. A professor at Towson University in Towson, Maryland, he teaches both graduate and undergraduate writing courses, including a course on Writing Science Fiction. He holds two PhDs, in literature and psychology.